This disparity image was created using a single Rovio robot by taking pictures from two different locations. I’m a bit late to the game of Rovio hacking, but here I am experimenting with using a Rovio I bought two years ago. The Rovio by Wowwee is a remote control car that has a camera mounted on it that can be controlled over wireless web based interface. When it was discontinued, the existing stock was liquidated in a fire sale, where they were sold for around $100 each. You can still buy them now, for about $400, on Amazon. Keep in mind you might need to buy a new battery and power supply. One of the things that makes Rovio so great, and more than a simple toy, is that it can move in any direction! Which means, that unlike your standard remote control car, it can move sideways. This is exactly what you need if you want to do stereo vision and create a point cloud. You will need to do the following once so that your camera is calibrated and that the software knows your robots parameters. Once you have done all of that all you need to do now is place the Rovio in a well lit room in front of something with lots of texture and run AutoPointCloudApp. That app will automatically figure out which robot it is controlling, loading calibration, collect and image, move the robot, and collect another image. 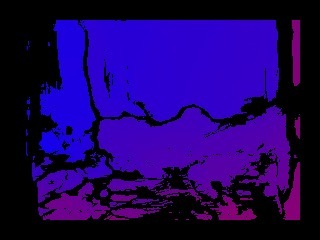 The two images are then processed and the results displayed. Don’t forget to change the IP address in the main() function of AutoPointCloudApp. Associated points between the two views using SURF features. Synthetic top view created using 3D points computed from the disparity image. Will Liquidlogic Stand by their Drain Plugs? Loiquidlogic Stomper missing its drain plug. 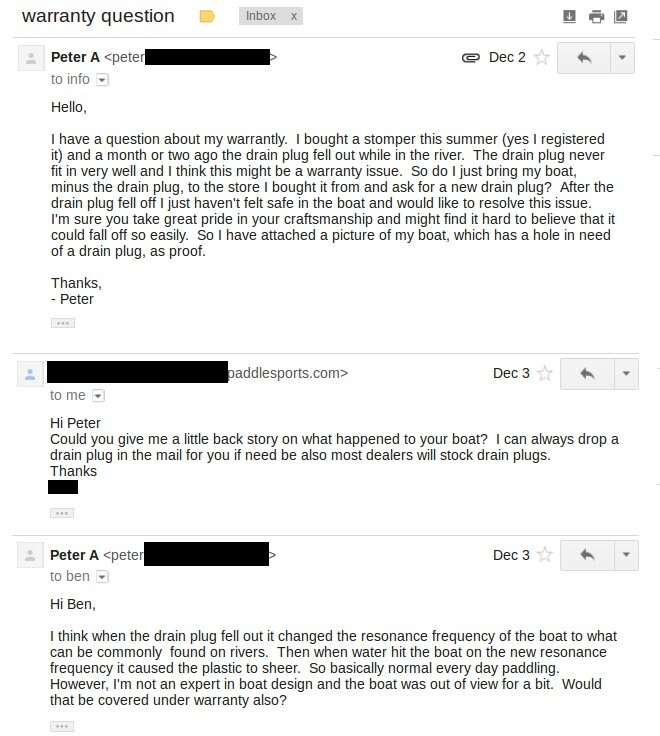 At the end of October 2012 my boat finally lost its drain plug. The drain plug had issues almost from the start and never really liked being attached of the boat. Sometimes it would take a minute or so to screw it in, unless you aligned things just right. While a minor issue really, things changed when it finally left the boat entirely. After taking a picture of the boat (right) I felt it was time to contact Liquidlogic and see if they would stand behind their products and provide a new drain plug. E-mail exchange is posted below. While Liquidlogic was very quick to help out and provide a new drain plug, they seemed less inclined to consider related structural damage. Would have been nice if they replied to the last e-mail. 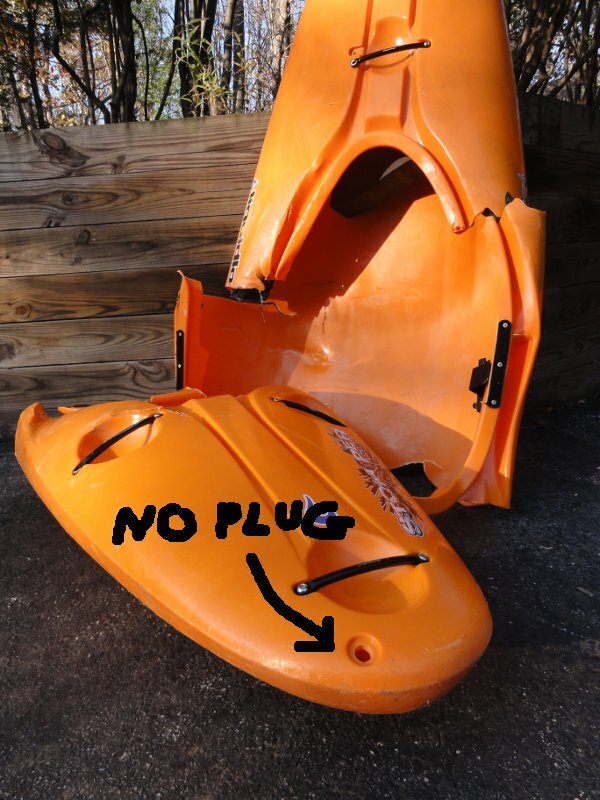 Just in case you are wondering, the drain plug was lost while the boat was stuck underwater for several days. Swam after my paddle just stuck in a rock on the first rapid in Greatfalls Virginia.